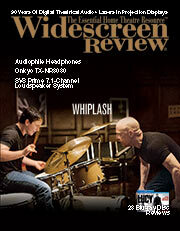 Widescreen Review provides reviews of the latest DVD releases and new video technologies. The widescreen reviews are concise, accurate, and dependable. Frequently, the magazine explains in detail about recent technology and why and how our latest gizmos work. I loved the articles on various display technologies - how they are different, how they work, and how they will replace CRTs in the near future. Widescreen Review has updated my video knowledge more than any other video rag.